I had to go to the lab this morning to draw blood. I told Dave to do whatever he wanted for breakfast because I had to fast. Before I even left for my lab work, a friend came by to pick up Dave to go out for breakfast. I guess I need watch how I say things. I joined 10 other women at the marina for lunch today. 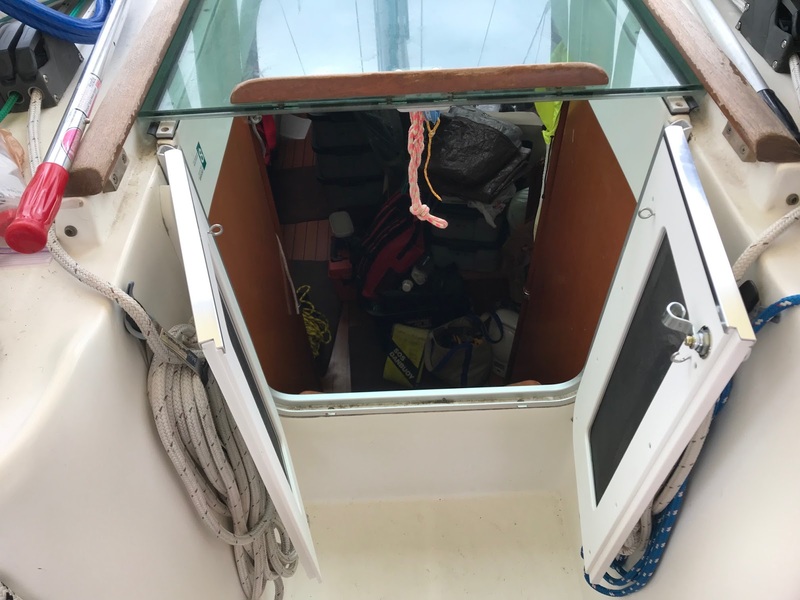 A local boater chose a restaurant with a buffet for lunch. I knew at least 4 of the women, so I was fun to meet some others. Everyone has a different boating experience. I spent the rest of the day washing all of our bedding. This morning, I had my annual physical. 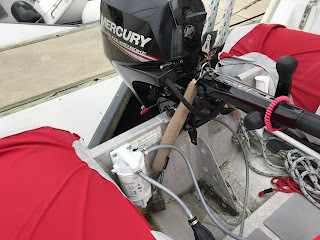 Dave took the outboard off of the dingy and mounted it on the stern of the boat. It will remain there until we get to the Bahamas this winter. 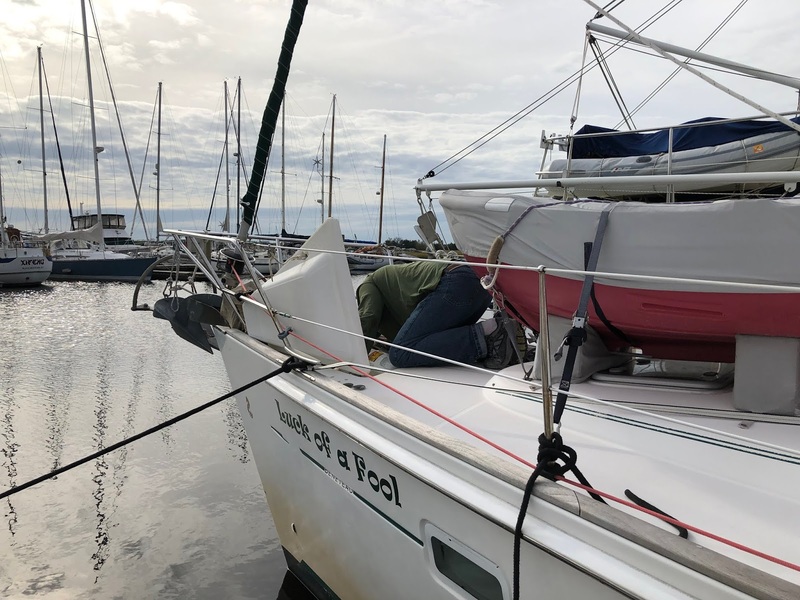 He also started working on a plan to remount the windlass for a better flow of the chain over the gypsy. It hasn’t felt right since he replaced them last June. Dave had an appointment in St Mary’s, Ga this morning for his annual lab work at the VA. We took Fred and Patti’s car this morning. Afterwards, we had breakfast at a little cafe downtown that we remembered from our summer here 2 years ago. We also saw a wild boar along the interstate. When we got back to Brunswick, we ran more errands with the car, picked up packages at the marina office, used one of the boxes to return an item, which we took to the post office. Then we went to West Marine for boating “whatever”. We ran into Duane and Peg there. They had taken an Uber there and were getting groceries nearby, too. We offered them a ride back to the marina, but only if they wanted to go to a Mexican restaurant with us first. That was an offer they couldn’t refuse. We got back to the boat in time to reboot and go to happy hour. I was the only one of us 4 that went. I visited with some of the women I met on Wednesday and called it an early night. I spent the day cleaning, doing laundry and writing and sending our Christmas letters. Most are sent via e-mail with less than 10 mailed in a card. 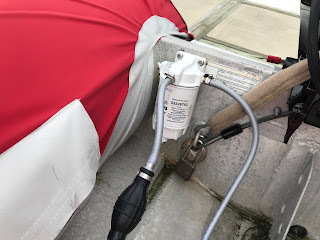 Dave changed the gas filter in the dingy and replaced the fuel lines. He said enough people stopped and talked to him today while he was placing the filter that he wouldn’t be surprised if it was stolen while we were gone. Actually, this place has been very safe with security. 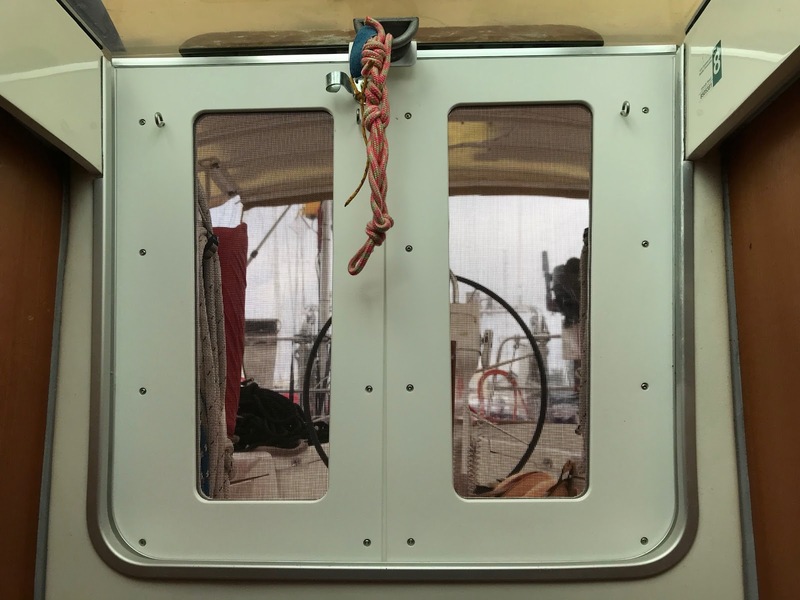 Dave also mounted new doors for our companionway. 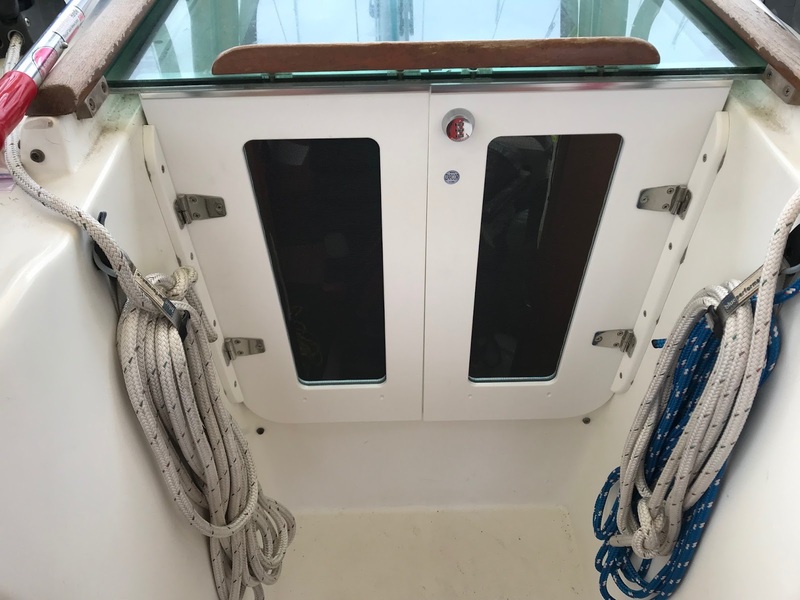 The original doorway had 2 sections that have to lifted out and laid aside, then replaced every time you entered or exited the boat. 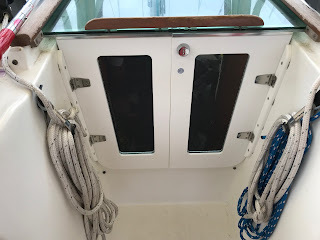 These door open in and out on hinges. No more removing and replacing!! We’ve been researching these for a couple years and finally made the purchase. Selling my office building in September helped move this project along. All the reviews included “and your wife is going to love them!” And I do! !